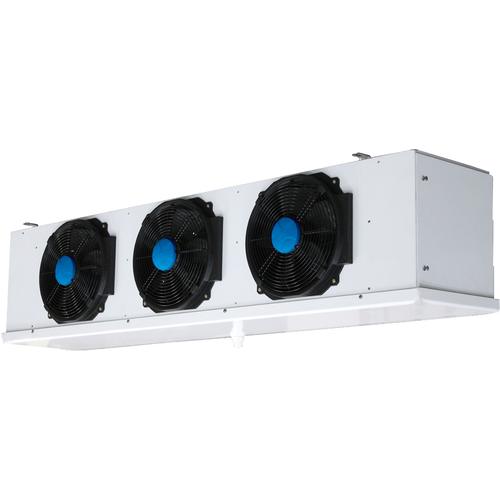 Kreyer Fan Unit for Rooms Up To 17,500 cu.ft. $1,199.99 & FREE Shipping on orders over $59. The heat exchangers inside the units are made from corrugated aluminum fins and internally grooved copper tubes. The white ABS casing looks great. Because of its rounded corners it has no water retaining areas favorable to germ development. Both series are fitted with stainless steel screws and show no sharp, cutting edges. The SD-S series has been designed especially for problematic environments such as wine-cellars with high moisture. The high-performance fans on the SD-S unit are lubricated for life. Cool a room up to 17,500 when the ceiling and walls are well insulated. Cooling a room this size from 90F to 60F will use approximately 1.05 tons of cooling power from your chilling system. If the room is half insulated you will need approximately 50% more power or 1.6 tons of cooling power. Once you've achieved the desired temperature it takes considerably less power to maintain it. 3/4 in. Solenoid Valve - Allows or blocks flow of glycol through the fan unit. Needs to be connected to a Controller to function. A filter is recommended to protect the solenoid. 3/4 in. Solenoid Filter - protects the solenoid valve from any particulate or sediment.